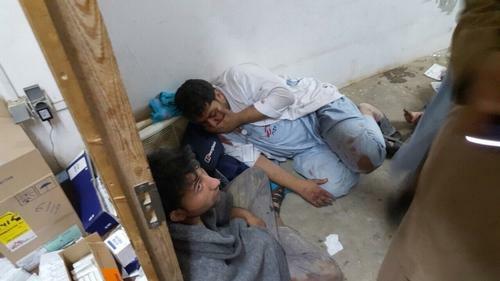 On Saturday 3 October 2015 the MSF Trauma centre in Kunduz was hit several times during sustained bombing by coalition forces, and was very badly damaged. Twelve staff members and at least 10 patients, including three children, were killed; 37 people were injured including 19 staff members. “Today the US government has admitted that it was their airstrike that hit our hospital in Kunduz and killed 22 patients and MSF staff. Their description of the attack keeps changing – from collateral damage, to a tragic incident, to now attempting to pass responsibility to the Afghanistan government. 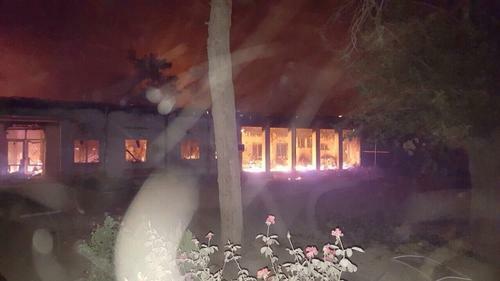 Fires burn in the MSF emergency trauma hospital in Kunduz, Afghanistan, after it was hit and partially destroyed by missiles 03 October 2015. It is with deep sadness that we confirm so far the death of twelve MSF staff during the bombing of MSF’s hospital in Kunduz. Latest update is that 37 people were seriously wounded during the bombing, of whom 19 are MSF staff. Some of the most critically injured are being transferred for stabilisation to a hospital in Puli Khumri, 2 hours’ drive away. There are many patients and staff who remain unaccounted for. The numbers keep growing as we develop a clearer picture of the aftermath of this horrific bombing. This attack constitutes a grave violation of International Humanitarian Law. 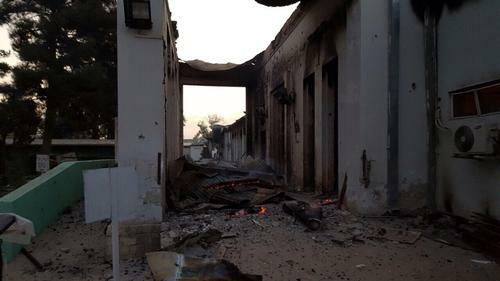 MSF condemns in the strongest possible terms the horrific bombing of its hospital in Kunduz full of staff and patients. All indications currently point to the bombing being carried out by international Coalition forces. MSF demands a full and transparent account from the Coalition regarding its aerial bombing activities over Kunduz on Saturday morning. MSF had informed all fighting parties of hospital GPS coordinates. MSF wishes to clarify that all parties to the conflict, including in Kabul and Washington, were clearly informed of the precise location (GPS Coordinates) of the MSF facilities – hospital, guest-house, office and an outreach stabilization unit in Chardara (to the north-west of Kunduz). As MSF does in all conflict contexts, these precise locations were communicated to all parties on multiple occasions over the past months, including most recently on 29 September. Surgery activities in one of the remaining parts of MSF’s hospital in Kunduz. In the aftermath of the bombings on the 3rd October 2015. Not a single member of our staff reported any fighting inside the MSF hospital compound prior to the US airstrike on Saturday morning. The hospital was full of MSF staff, patients and their caretakers. 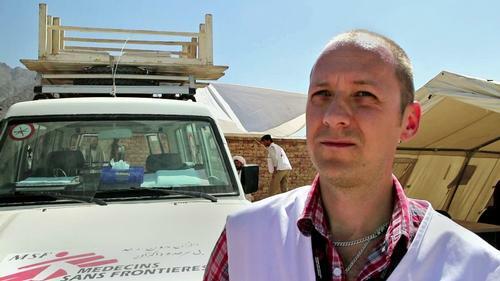 It is 12 MSF staff members and 10 patients, including three children, who were killed in the attack. at first light, the morning after the facility was hit by sustained bombing. 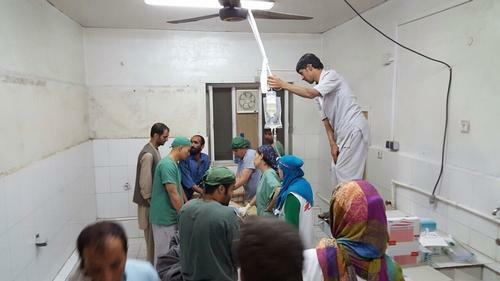 “MSF is disgusted by the recent statements coming from some Afghanistan government authorities justifying the attack on its hospital in Kunduz. These statements imply that Afghan and US forces working together decided to raze to the ground a fully functioning hospital – with more than 180 staff and patients inside – because they claim that members of the Taliban were present. This utterly contradicts the initial attempts of the US government to minimise the attack as ‘collateral damage’. There can be no justification for this abhorrent attack on our hospital that resulted in the deaths of MSF staff as they worked and patients as they lay in their beds. “There are no words for how terrible it was. In the Intensive Care Unit six patients were burning in their beds.